Happy Friday! This week I have a little Color My Heart Color Dare Tracey Trivia: The Color My Heart Color Dare challenge was founded in 2011 by Sarah Stone – Sarah is no longer a design team member, however she still participates on a fairly regular basis. I first participated in the Color Dare in April of 2015, I was too late to actually link up my card (time zones used to give me hives) but I stuck around and my first official entry was #143 – the challenge was black, white & gold and you can find that card here. I was an Emerald Winner with that challenge and I guess you could say that being a winner brought me back. My first Guest Appearance as a Design Team member happened on May 28, 2015. Pretty much from that point on I’ve been hooked…sure I’ve taken a break now and then, but my first love is the Color My Heart Color Dare Challenge. Why am I telling you this? Lately “the Color Dare” has been lacking participants…we aren’t sure if it’s summer, back to school or that suddenly everyone has quit stamping (gasp)! This week is the perfect week to get started – or come back – really what do you have to lose? Basically the rules are pretty simple – you create with a color combination that we provide (if you don’t have the exact colors get them close) – in the Close to My Heart World this weeks colors are: Ruby, Peacock & Kraft. In the Stampin’ Up World your colors might resemble: Cherry Cobbler, Tranquil Tide & Crumb Cake. The point is there are some options. 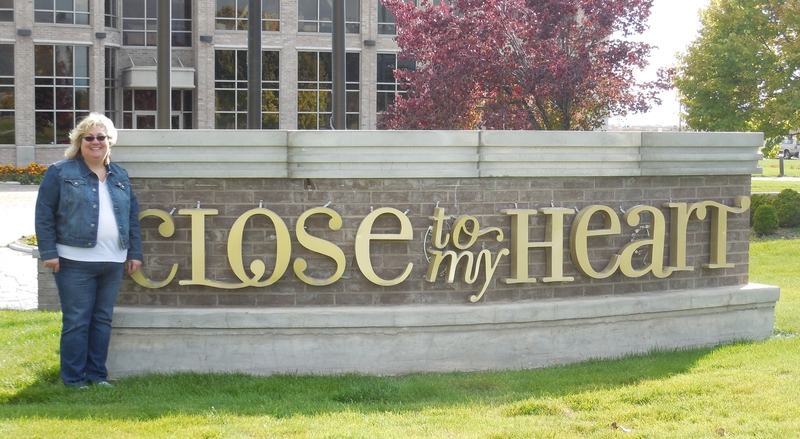 This challenge is not affiliated with Close to My Heart although there are lots of consultants on the Design Team. So, are you ready to get started? I am! I love Kraft cardstock – I think it’s an amazing neutral and probably a little because it reminds me of days before plastic bags at the grocery store (I still ask for paper). I saw a super cute card on Pinterest and although I didn’t have the exact same dies it gave me a fun idea for a card anyway. Everything on my card was die cut using Close to My Heart Thin Cuts – except the thin red strip (1/8 inch to be exact) and then adhered to the front of the card. So, now it’s your turn…the full details on how to join the fun is in the sidebar of our homepage. Each color dare is open for two weeks won’t you please come play along. If you are local to me and would like to come Create in the Coop – I’d be happy to help you just send me a message. Welcome back…today I’m bringing you a card that will work for three, yes three challenges!!! I have been working on Valentines for the past couple of days and knew that I wanted to incorporate the Color My Heart Color Dare challenge #278 Kraft, Bashful & Gold. 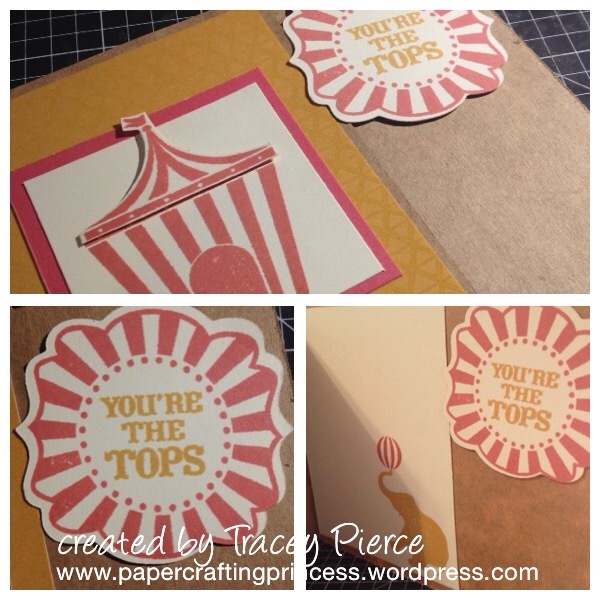 After looking at a couple of Sketch Challenges I dropped by the Heart To Heart blog when I found the Make It From Your Heart Challenge so I reached for Volume 4 and took off to making my card. After seeing an adorable card by my friend and fellow consultant Susan on Instagram I learned that the Three Amigo’s Blog Hop is hosting a Nom, Nom Challenge – S’mores rate really high on my nom nom list! So there you have it…three challenges in one card. I hope you’ll take a minute and stop by each of the challenges (and maybe even enter). Make sure you leave the DT members a comment because there are lots of work that goes into making these challenge happen. I appreciate you stopping by…let me know if you are a traditional red/pink Valentine maker or if you stray towards anything sparkly by leaving me a comment. 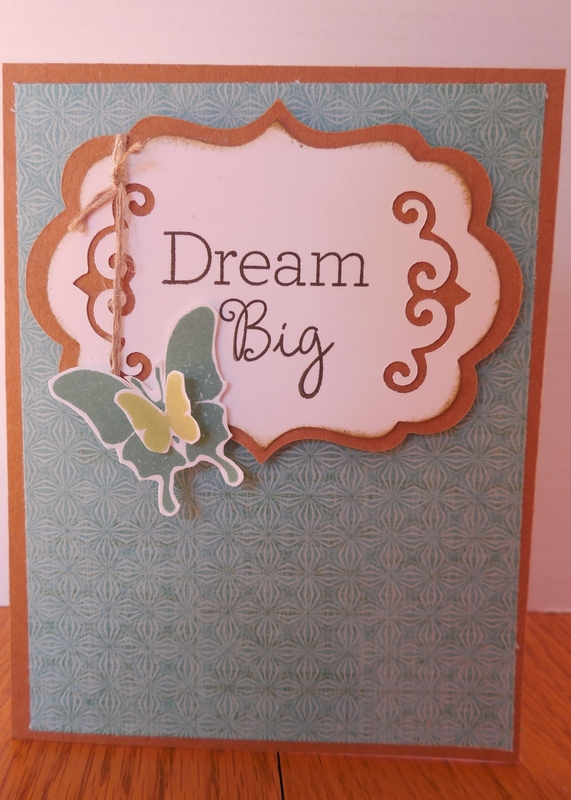 I checked out a couple of challenges today and found that both the Color Dare and Working 9 to 5 over at Heart to Heart Challenges fit right with the card I needed to make today! I am just about to burst my buttons today…my son started his first official job! Not to go into the details but this is a major accomplishment and not only did he get a job, but he was offered 4 different jobs and had his pick! Pretty good for someone that had never even interviewed! I wanted him to know that he is “tops” in my book! I layered a piece of Goldrush Fundamentals to the front and then added a piece of Hollyhock C/S. I stamped the “tent” on a piece of Colonial White in Hollyhock and knowing the square was too small stamped in a second time on a scratch piece and fussy cut the top which I paper pieced once everything was in place. I lifted it with thin 3D foam tape to give it just a little dimension. 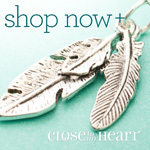 The sentiment is mounted to the flap area and serves a purpose to hold the card closed. On the inside I stamped an elephant playing with a ball. In case your wondering my son didn’t run off and join the circus, but I wanted him to know that I want him to have a “ball” at his new job and that I think he’s tops! Thanks for stopping by today. Check out the other participants at the two challenges and see what you might come up with and enter to have some fun! I really like the butterflies from the Your Own Kind of Wonderful Stamp set and was inspired by page 105 of the Annual Inspirations Catalog and Sketch #97 at Atlantic Hearts Sketch Challenge. TheB & T is the largest scrap that I had of the Skylark Paper Packet (I amost cried). I cut the shape (Oval 5) from the Cricut Art Philosophy Cartridge first in Kraft and then again using the Decorative Layer and Shift in White Daisy. I wrapped the sentiment in some Linen Thread and then popped up the whole thing with 3D Foam Tape. The Butterflies were stamped in Juniper and Sweat Leaf ink and fussy cut and layered together with a foam dot just in the center. 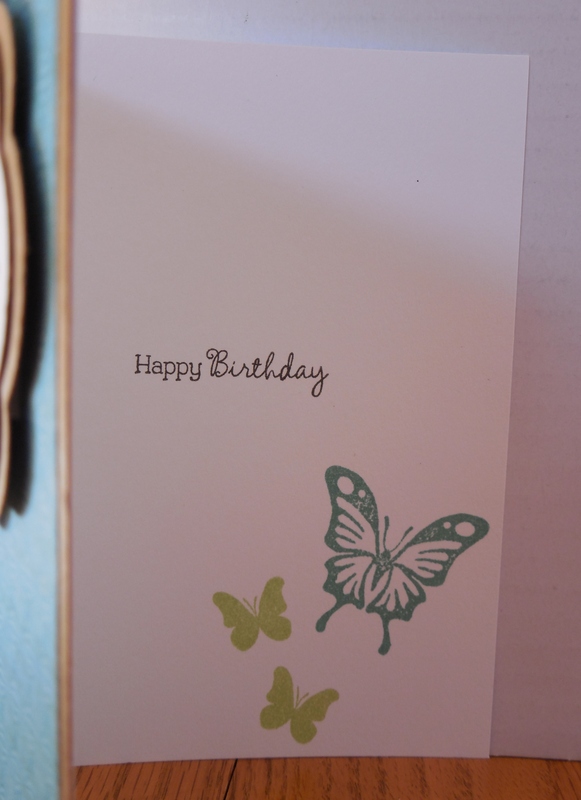 On the inside of the card I stamped a few more butterflies and the Happy Birthday from the same set. I just love it when a card comes together so simply! Thanks for stopping by…if you get a chance swing by the Atlantic Hearts Sketch Challenge either for some inspiration or just to be wowed by the artists!